Picked up a Logitech M515 mouse from Bureau en Gros/Staples ($40). The mouse is sealed at the bottom, except for the On/Off switch. It has one of those "unifying" receiver for the wireless function. Scroll-wheel does not do the middle-click: if you do the middle click, it toggles the scroll wheel to free scroll or clickity-click wheel. The middle-click is done by the [o] button near the wheel. The specs didn't indicate if it is SFF or full sized mouse. It is a SFF or laptop mouse. Unifying feature cannot be setup in Linux. As indicated in the document on Logitech Unifying Receiver, Unifying software does not support Linux. You have to setup the unifying feature separately e.g. setup on Windows and then reconnect the receiver and to Linux machine. I did it on a virtual instance but lost the cursor during the setup. Restarted VM and both worked fine. M515 is designed for couch (read cloth), so it might not function on glossy surfaces. Mouse pad, sofa, table top and paper worked; blue-ray player cover (black), glass, and fridge surface did not work. 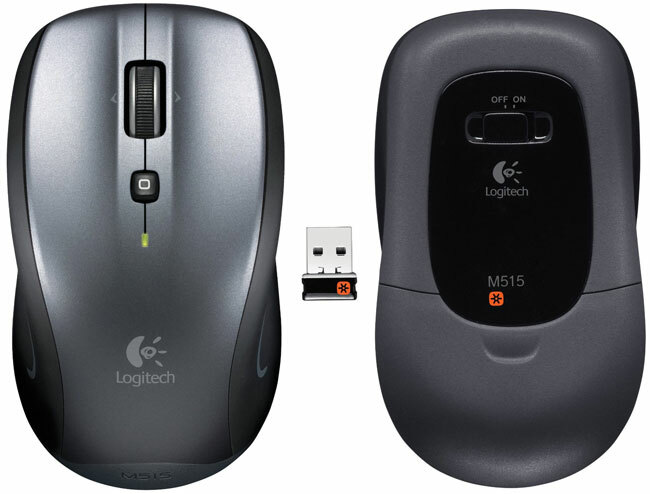 Logitech says that it is active when you hold the mouse. They don't lie and it is advised that you hold it properly as I noticed that it stopped functioning when holding lightly with two fingers. You can easily test by pushing it with one finger. I like the smooth scrolling wheel, but the M510's form factor suites my hand better. Works even if you are 3-4 meters away just like the M510. Lacks the extra buttons on the M510. One important question which comes to mind is the cover at the bottom. It consists of two parts: regular grey plastic cover on the outer side (see image) and the shiny dark translucent plate covering the laser inside. Over time, the shiny central part is going to get scratchy (it is not hardened glass) which would affect the performance of the laser. Would the scratches be enough to cause scattering of the laser so that the mouse gets confused? Still deciding if it stays or goes back.